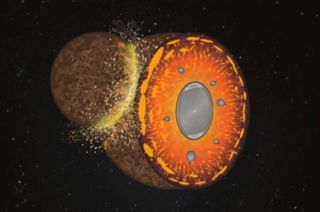 Artist's illustration showing a collision of a rocky body with the early Earth, causing pulverization of terrestrial crust. Mysteriously, Earth's chemical composition is drastically different from that of the rocks that most likely helped to form the planet. Now, scientists think they may have an answer to this long-standing puzzle: The constant pummeling that formed Earth may have altered its composition. Strangely, Earth appears to be low in silicon, potassium and sodium, and enriched in magnesium, calcium and aluminum, compared with enstatite chondrites. Now, for the first time, scientists think they may have an explanation for this mystery. "The most exciting aspect of these results is that it is the first time that anyone comes close to answering the question, 'Why does Earth have the same isotopic composition as enstatite chondrites but a different chemical composition? '"study lead author Asmaa Boujibar, a planetary scientist at NASA's Johnson Space Center in Houston, told Space.com. In experiments, the researchers melted enstatite chondrites at various pressures. This procedure mimicked how accreting rock might have behaved during Earth's formation. The experiments suggested that the heat of the newborn Earth left the rocks constituting its crust enriched in silicon and relatively low in magnesium. The research team's computer models then suggested that the many cosmic impacts that pulverized the young Earth stripped a great deal of this crust off the planet, leaving Earth relatively depleted of silicon and rich in magnesium. The heat from these impacts also would have made potassium, sodium, calcium and aluminum escape as gases from Earth. However, much of the calcium and aluminum would have condensed and returned back to Earth. That could help explain why the proportions of these elements on Earth are different from their proportions in enstatite chondrites, the researchers said. The nature of the impacts that might have caused this heat-based loss of matter from Earth remain uncertain, Boujibar said, adding that the impacts might have involved giant rocks, very fast rocks or very hot rocks. Uncovering the nature of these impacts would shed light on how Earth formed, she added. For instance, very fast rocks might be the result of Jupiter moving closer, and then farther away from, the sun and gravitationally slinging around rocks at high speeds, while very hot rocks were seen in the solar system soon after it formed. Boujibar and her colleaguesdetailed their findings online Sept. 23 in the journal Nature Communications.